In my head, all three of my kids are little bitty babies. They are my babies, and (obviously) never allowed to grow up, start making me feel old, not wanting my company, and insisting I stop giving them a hug and kiss before we part. So when I would pass the board game aisle, I would not give them a second thought- my babies were not KIDS yet, board games were way too advanced, surely. Of course, then I started to realize my girls are a firm FOUR, turning FIVE in January. The preschool games- well, they probably should have started them a year ago! And hey- it sounded like something fun to do with them during the hour after baby goes to bed, but before the girl's bedtime, the scarce hour they have me all to themselves. (and sometimes The Husband is there too) For Easter last year, they got a couple little Hello Kitty games in their baskets (the games were kind of hidden by the cute toys and candy) and I had not really thought they would go over so well with the twins. But oh, goodness! I simply cannot play another game of Hello Kitty Bingo, Hello Kitty Old Maid, or Hello Kitty Go Fish. I can't. I CANNOT! I swiftly purchased Candy Land- my favorite game as a kid- to spice things up. I was delighted to find the kids got the concept, were able to follow along pretty easily, and were having a ball. Even if us, (ahem) older players were not exactly having a rollicking good time. (I give The Husband "the look" whenever he started with the trash-talking. Just because you got the chocolate square to zoom ahead of the rest of us.... you're bumming out the 4 year olds, man!) After two games, The Husband was complaining. It is a bit of a slow moving game, and we were being badgered into playing it every single night. 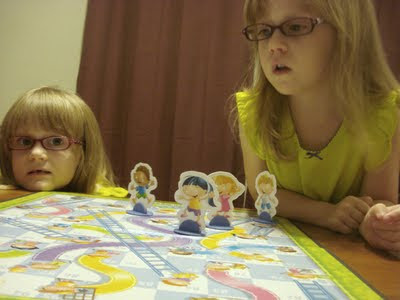 Turns out Chutes and Ladders has the capability of taking forever. Like Monopoly-style FOREVER. Everyone hits the big slide all the way to the bottom and we all START OVER. It's maddening. - I can't read numbers upside down. I'm constantly going the wrong way, and The Husband acts like I'm on the short-bus because of this. - Everyone has to win. Well, at least each of the kids have to reach the end before we can stop playing. Bunny reached the top? We keep going until Squirt does too... sometimes I stealthily force the spinner onto the exact number to the winning ladder- I'm not above cheating... after 45 frustrating minutes of bumbling game play. - It's just not fun unless you're four. I'd rather be watching House Hunters International right now. - Now I'm whining about playing games with my children. Bad Mommy! Games are great, and can be oh so educational. Try any of the games by Gamewright. They make games for all ages and usually take 10 to 15 minutes to play. Hours of chutes and ladders would kill anyone. I do the same thing, thinking--Oh, my kids aren't old enough for ___ yet! I can hardly imagine that they will be ready for board games soon.